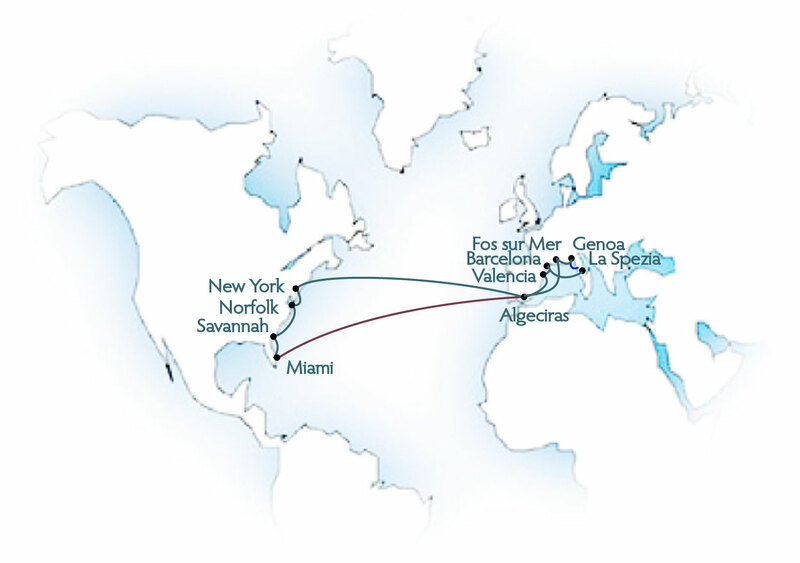 South Seas and Coastal Today's passenger freighters are mostly containerships, French and German, with 20-25 international officers and crew on board, and 2 to 6 passengers (max. 12). 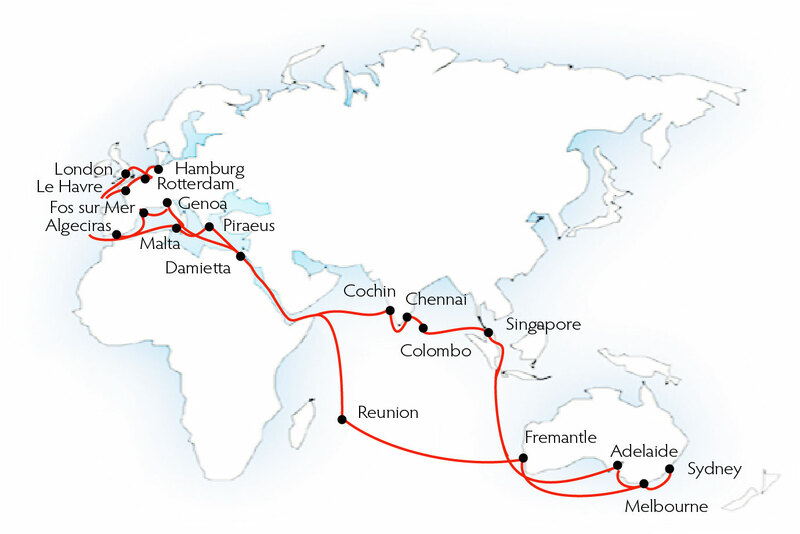 Continues roundtrip voyages are offered, as well as longer one way voyages, between the continents only. 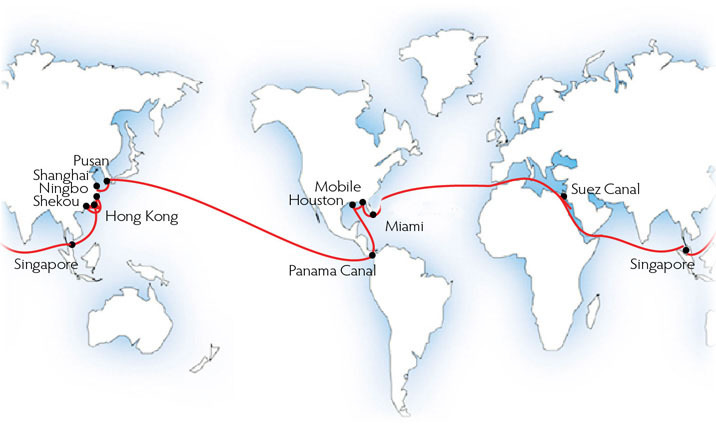 Houston, TX (Day 1), Mobile, AL (2), New Orleans, LA (4), Miami (7) and Jacksonville, FL (9), transatlantic and through the Suez Canal (24); Singapore (45); Hong Kong (50), Shekou (51), Ningbo, (54) and Shanghai/YS, China (56); Pusan, Korea (58); transpacific and through the Panama Canal (78) back to Houston (83). New Orleans, LA (Day 1); Mobile, AL (2); Freeport, Bahamas (5); Le Havre, France (16); Antwerp, Belgium (17); Rotterdam, Holand (19); Bremerhaven, Germany (22); Charleston, SC 33; Altamira (37) and Veracruz, Mexico (39); New Orleans (42). Sailing every five weeks: Le Havre, France (Day 1); New York (8); Norfolk, VA (11); Savannah, GA (13); Charleston, SC (15); Southampton, UK (28); Antwerp, Belgium (29); Rotterdam, Holland (30); Bremerhaven, Germany (32); Le Havre (35). 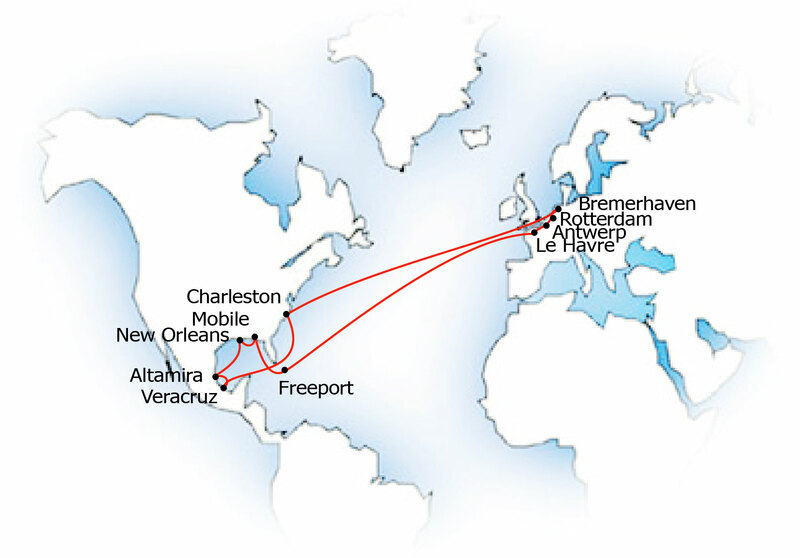 Sailing every three or four weeks: Le Havre, France; Antwerp, Belgium (Day 1); Rotterdam, Holland (2); Bremerhaven, Germany (4); Charleston, SC (15); Miami, FL (17); Veracruz (21) and Altamira, Mexico (22); Houston, TX (25), New Orleans, LA (28) and Le Havre (42). 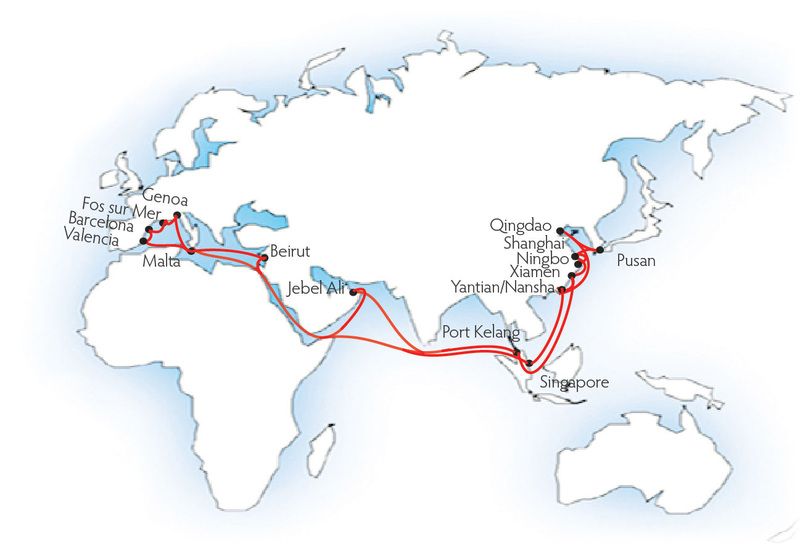 Sailing every week or two: London (Gateway port terminal), UK; Rotterdam, Holland (Day 1); and Le Havre, France (3); Philipsburg, St. Maarten (13); Port of Spain, Trinidad (14); Cayenne (Degrad des Cannes terminal), French Guiana (18); Belem-Vila do Conde (23), Fortaleza (26) and Natal (28), all in Brazil; Algeciras, Spain (38); London (42). New York (Day 1); Norfolk, VA (3); Savannah, GA (6); Miami, FL (10); Algeciras, Spain (19); Fos sur Mer, France (21); Genoa, (22) and La Spezia, Italy (25); Barcelona (28) and Valencia, Spain (29); New York (40). 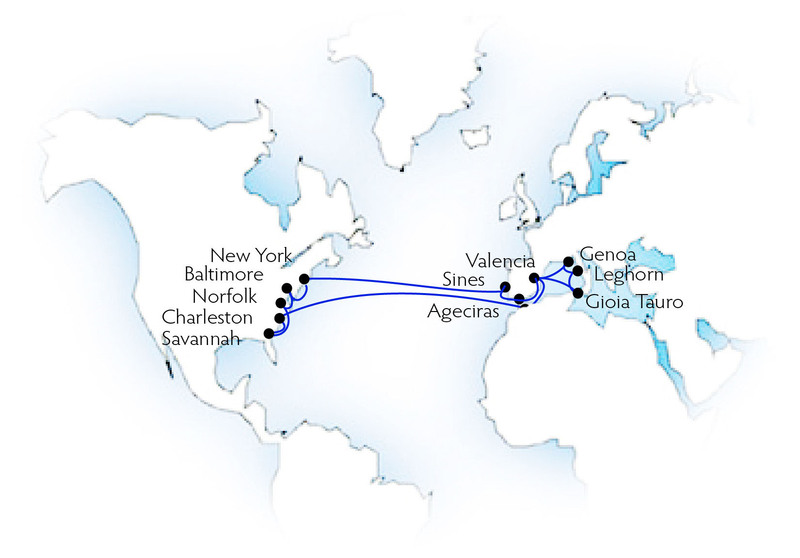 Sailing once every 7 weeks: New York (Day 1); Baltimore, MD (2); Norfolk, VA (3); Savannah, GA (6); Charleston, SC (7); transatlantic to Algeciras (17) and Valencia, Spain (19); Gioia Tauro (23), Leghorn(25) and Genoa, Italy (26); Valencia (29) and Algeciras, 2nd calls (32); *Sines, Portugal (33) and transatlantic back to New York (42). -- *It's not possible to embark or disembark in Sines. Los Angeles (Day 1) and Oakland, CA (5); Fuking (22), Nansha (23), Honk Kong (24), Yantian (25) and Xiamen, China (27), back to Los Angeles (42). Sailing approx. 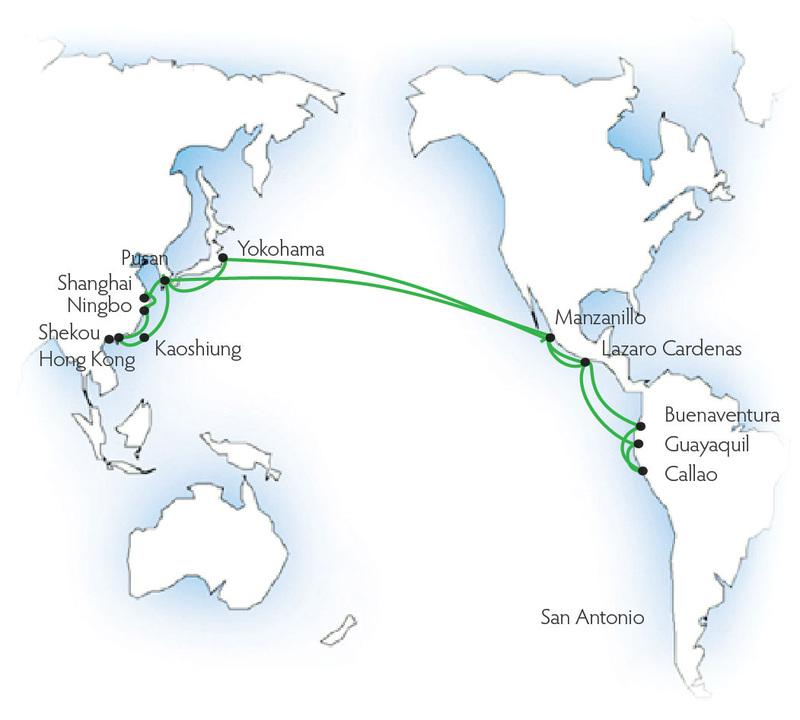 every two weeks: Hong Kong, Shekou (Day 1), Ningbo (5) and Shanghai, China (6); Pusan,* Korea (10); transpacific to Manzanillo (27) and Lazaros Cardenas, Mex. (28); Buenaventura, Colombia (33); San Antonio, Chle (41); Calao, Peru (45); Lazaros Cardenas (52) and Manzanillo (53), 2nd calls; Yokohama, Japan (70); Pusan, 2nd call (72); Kaohsiung, Taiwan (75) and Hong Kong (77) -- * No embarkation. London (Gateway port), England (Day 1); Rotterdam, the Netherlands (2); Hamburg, Germany (Day 5); Le Havre, France (7); Fos sur Mer, France (13); Genoa, Italy (14); Damiatta, Egypt (18); transit the Suez Canal (20); Pointe de Galets, Réunion (30); Fremantle (40), Melbourne (45), Sydney (48) and Adelaide, Australia (52); Singapore (63); Chennai, India (68); Colombo, Sri Lanka (71); Cochin, India (73); transit the Suez Canal (82); Damietta, 2nd call (83); Piraeus, Greece (86); Malta (88); Algeciras, Spain (92); London (97). 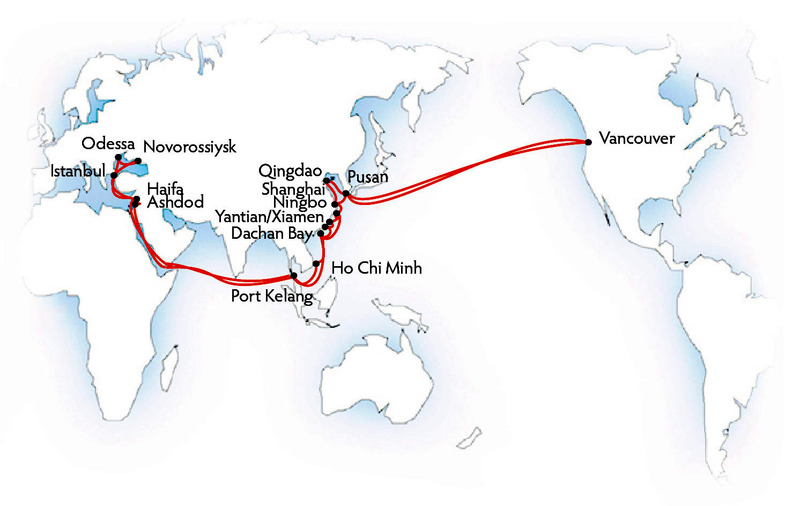 Southampton, England; Le Havre, France (Day 2); transit the Suez Canal (10); Khor Al Fakkan, UAE (18); Port Kelang, Malaysia (28); Xiamen (34) and Tianjinxingang, China (39); Pusan, South Korea (41); Ningbo (44), Shanghai (46), and Yantian (49), all in China; Singapore (53); transit the Suez Canal (66); Algeciras, Spain (71); Southampton, 2nd call (75); Dunkirk, France (76); Hamburg, Germany (79); Rotterdam, Holland (82) and Southampton (84). Sailing weekly: Genoa, Italy (Day 1); Malta (4); Beirut, Lebanon (8); transit the Suez Canal (10); Jeddah, Saudi Arabia (12); Jebel Ali, UAE (18); Port Kelang, Malaysia (28); Xiamen (35) and Qingdao, China (36), Pusan, Korea (40); Shanghai (42), Ningbo (44), Nansha (48) and Yantian (49), all in China; Singapore (53); transit the Suez Canal (65); Malta (68); Valencia (72) and Barcelona, Spain (74); Fos sur Mer, France (75) and Genoa (77). Sailing approx. 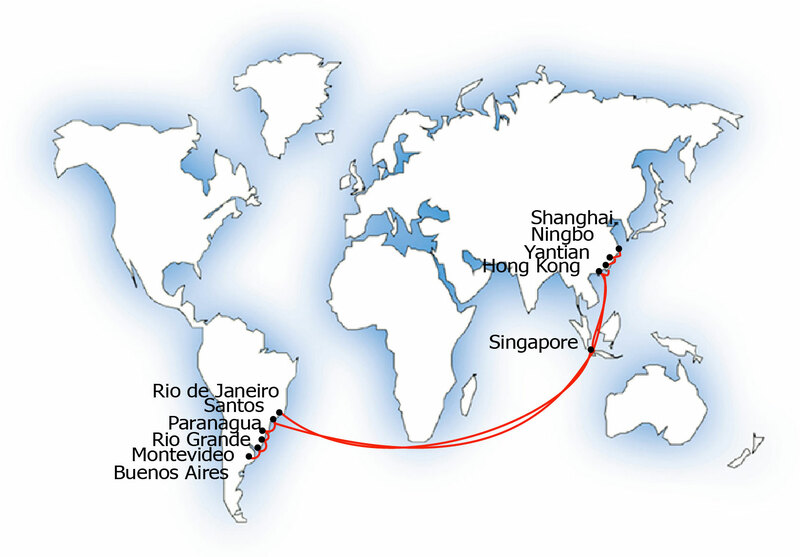 every 6 weeks: Shanghai, Ningbo (1), Yantian (3) and Hong Kong (4) all in China; Singapore (9); Rio de Janeiro (32), Santos (33), Paranagua (34) and Navegantes (36), all in Brazil; Montevideo, Uruguay (38); Buenos Aires, Argentina (40); Rio Grande (45), Navegantes (47), Paranagua (48) and Santos, 2nd call (50), all in Brazil; Singapore (75); Hong Kong (80) and Shanghai (84). Sailing approx. 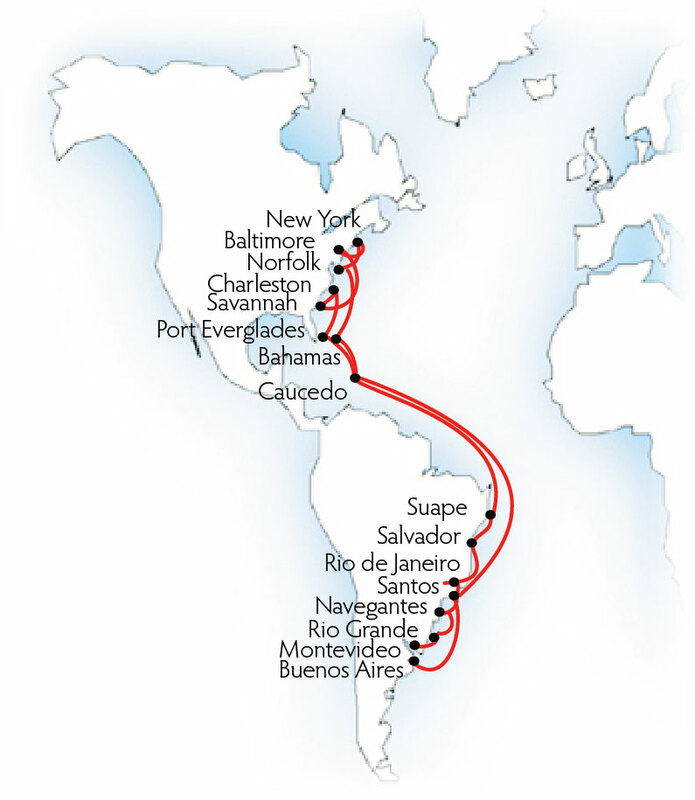 every seven weeks: New York, Newark terminal (Day 1); Norfolk, VA (2); Baltimore, MD (3); Charleston, SC (6); Savannah, GA (7); Port Everglades, FL (9); Caucedo, Dominican Republic (13); Santos, Brazil (24); Buenos Aires, Argentina (27); Montevideo, Uruguay (29); Rio Grande (31), Navegantes (33), Santos, 2nd call (35), Rio de Janeiro (37); Salvador (40) and Suape, Brazil (43); Caucedo, 2nd call (49); Freeport, Bahamas (53) and New York (56). 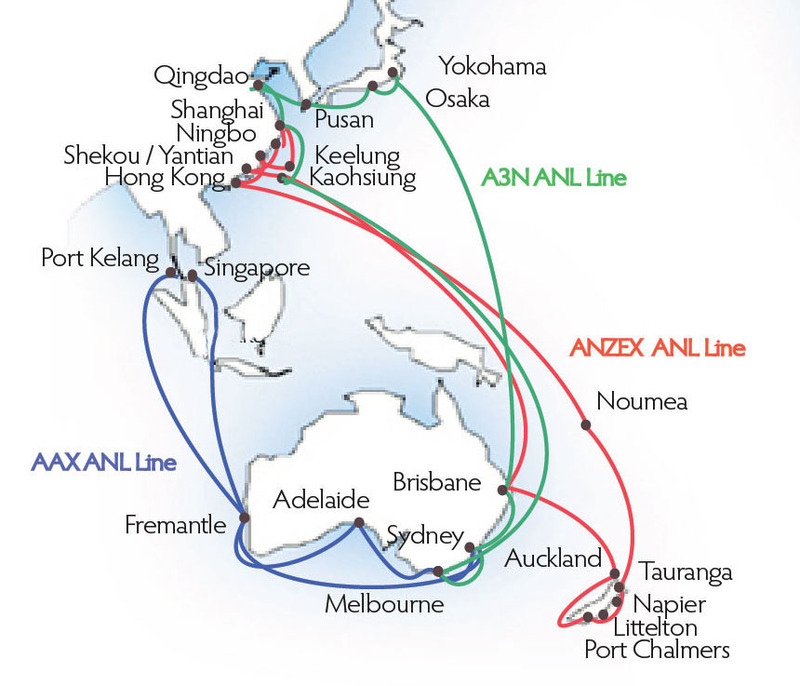 The CMA CGM Amber sails from Australia via New Zealand to China every seven weeks. 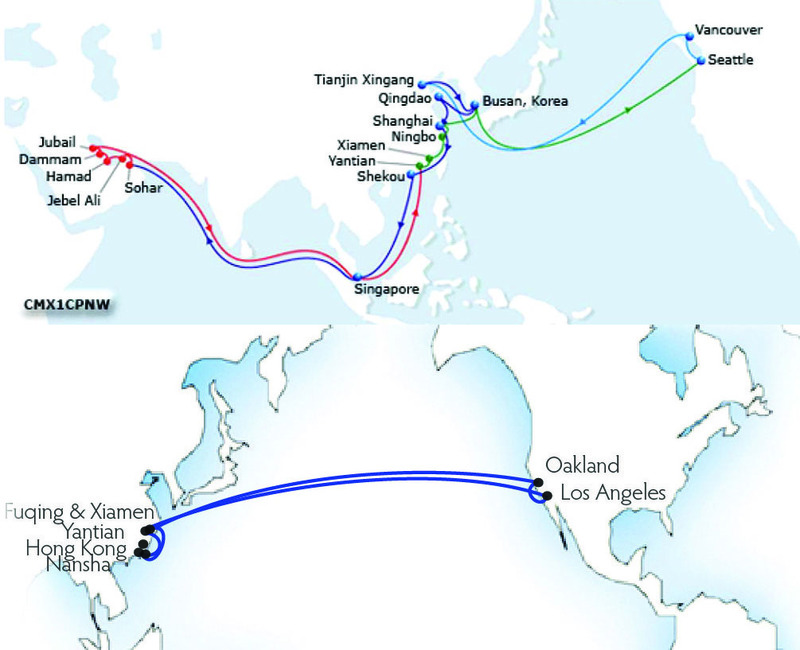 The CMA CGM Georgia and sisterships offer voyages from Australia to Japan, S. Korea and China every couple of weeks. 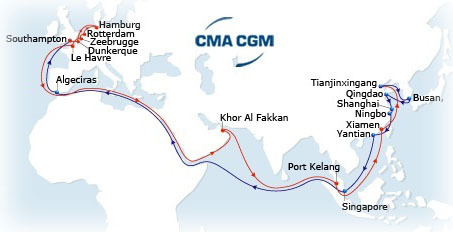 The CMA CGM Rossini and sisterships connect Singapore and Malaysia with Australia's East and West Coasts, every week or two.